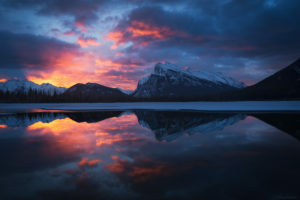 Sunrise from Vermilion Lake II – March & November offer great back-lighting. Pray for rays of light bursting between the summits! Lots of good compositions, walk forward to the bay, walk uphill for the grand view + use a variety of focal lengths as Mt Rundle is further away. 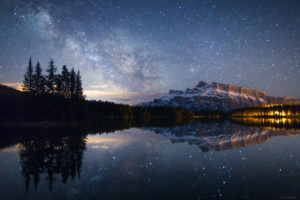 The milky way rising beside Mt Rundle from Two Jack Lake in May. May is the best time to catch the galaxy angled lower in your compositions. 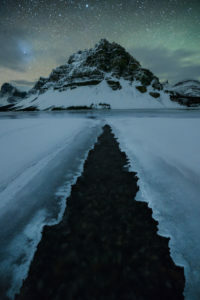 Sunrise, or night photography – A North facing view and one of the best places for a chance to see the Northern lights (check the facebook group ‘Alberta Aurora Chasers’ to see if there is any auroral activity or download an Aurora alert app on your smartphone for the current outlook and forecasts). Park and make sure to walk along the lakeshore 5 minutes to find the red chairs which is next to the famed lone tree. Walk even further for more interesting lakeside compositions. Winter time along The Lake Minnewanka shoreline is quiet, cold, and spectacular. Great view of Banff town but the best view is off the back side facing Mt Rundle. Great morning walk when light is striking the face of it, lots of uphill, 30 minutes or so to the top. 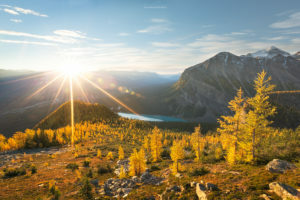 Best short walk starting in Banff, and a great workout during your day. 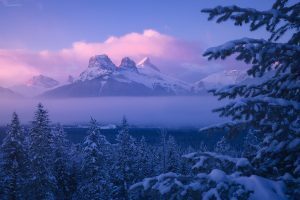 Light rays pierce through the mist covering the top of Tunnel Mountain in Banff. 5 minutes drive from the centre of Banff take the gondola up (or walk, but this takes a couple of hours and is very strenuous!). Best at the edges of the day and for night photography if the last gondola down allows. Best (aerial like) view of Banff there is as Cascade Mountain rises directly behind the town. When at the top make sure to walk over to the cosmic ray station (A National Historic Site!) for the best shots. I don’t have any photos from Sulpher Mountain as I have not been back to the top since owning a good camera! Its free for locals on Wednesday to ride the gondola so I’ll have to visit soon. Park at the bridge and walk through the gates to the riverside. 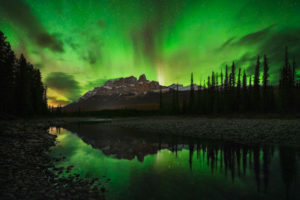 Best at sunset when the light hits the whole face of the mountain but also great during atmospheric weather and is North facing for the possibility to photograph the aurora borealis above the peak (see photos below). 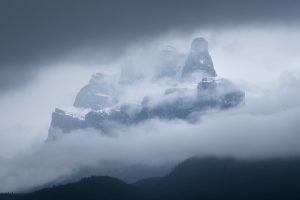 Also driving 10 minutes towards Banff down the Bow valley Parkway (1A Hwy) from Castle Junction and you will reach Johnston Canyon – just before the Johnston Canyon car park is a great road shot leading to Castle Mountain. Bring waders/gumboots and explore the river edges further up and down stream. Park at the dog park on Bow Valley Trail just past Alpine Helicopters on the 1A Hwy and then walk across the road following the dry creek bed downhill to the famous reflection pools (5min walk). There are lots more compositions to find if you bring gumboots/waders! Best at sunrise in summer when the sun lights more of the front of the peaks. Can get very busy with people especially on a weekend so I would recommend going early/sunrise. An absolute must see classic. Walking down the lake along its right hand shores all the way to the back and you can find more unique angles. Park at the restrooms near Num Ti Jah Lodge and explore the shorelines. In October ice and hoar frost begin to form along the edges which is amazing for foregrounds. Bring warm clothes as it gets chilly with katabatic winds off the nearby Bow Glacier and Wapta Icefield. Best at sunrise, or for night photography. Just past Bow Lake so do them together. You will need to walk 10min from the car park to the main viewing area. Even better views which you will have to yourself are available if you explore further uphill past the viewpoint another 10min, first along the interpretive trail and then following your nose a little further to a big clearing with jutting rocks. Best at sunset, and for night photography (North facing view for aurora). Try to time it for fresh snowfall but still have open water in September/October for some amazing shots. 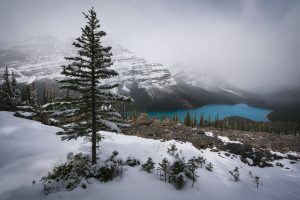 Fresh snowfall and the beautiful turquoise glacier water of Peyto Lake. Cascade Ponds – 5 min from Banff. Great bridges and reflections. Enjoy a fire using one of the fire pits if there are not any fire bans in place. The Banff Springs Hotel from the Banff Centre side of the Bow River – Almost right at The Banff Centre the spot is called ‘Surprise Corner’ likely for the view! Fantastic wide angle view including the Bow River in the shot or telephoto shot of the hotel rising from the forest. Great scene at night or with fresh snow. Mt Norquay viewpoint – 10min from Banff. Drive uphill towards Mt Norquay ski resort – on the last corner there is a big field with a grand view of Banff. Watch out for Big Horn Sheep! It’s a good place to see them but do not feed or approach them. East End of Mt Rundle ½ day hike (starts at Whiteman’s Gap near Canmore) – 30min from Banff. Amazing view of the pointy sharp Ha Ling Peak. Take care as there are steep drops and loose rock. Not recommended in winter. The diving board at Herbert Lake – 55min from Banff. Park at Herbert Lake day use area. Great spot for reflections, especially at sunset. Walk clockwise around the lake about 10min until you find the hidden diving board at the back. Walk the plank and take a swim if you dare, its right of passage for the Lake Louise locals! Johnson Lake – 10min from Banff along the Minnewanka Loop. 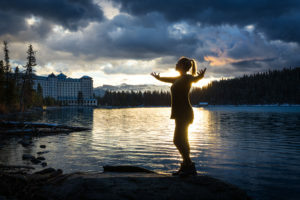 Park at the lake and explore – there is a hidden cabin in the woods as well as scars from an old coal mining settlement (Anthracite) near here. Both are hard to find! Island Lake – 45 minutes from Banff. Park 500m South of Morants Curve on the 1A Hwy. Use Canada Topo maps app (or better, a GPS) to watch your position in relation to the lake and head into the forest for about 20min. No trail unless you are lucky and find a game trail. If you want to go ask me for more information if you like! The swimming hole near Castle Mountain – 30min from Banff. Some summer days you may notice a few cars on the Banff bound side of the Transcanada Highway near castle Junction. Follow your nose! 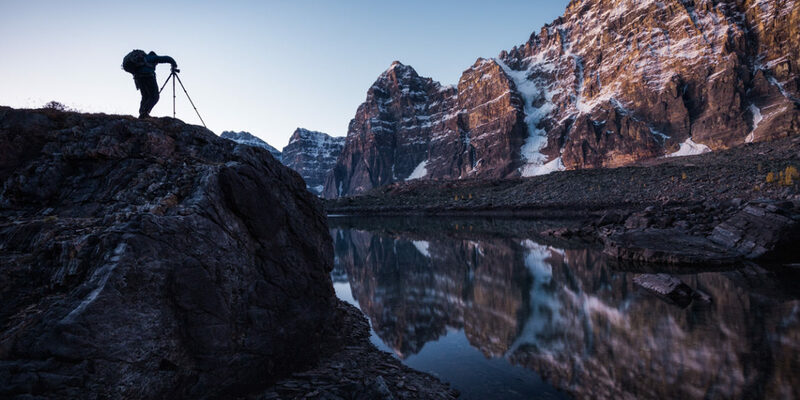 Lake Agnes + Big Beehive ½ day hike (starts at Chateau Lake Louise) – 50min from Banff. Parking may be an issue so consider riding the Parks Canada shuttle bus located at overflow parking along the Trans Canada Highway before Lake Louise. Head first to the teahouse and then around the back of Lake Agnes and up to the top of Big Beehive on the official trail. Great top down view of Lake Louise. Waterfowl Lakes – 1hr 30min from Banff. Just 10min drive past Peyto Lake. Amazing views of Mt Chephren. Park at far end of the lake at the pull out on the West side of the road. Follow the trail down to the lake and then along its shoreline for 10min until you are almost right beneath Mt Chephren. Awe inspiring! Note: Moraine Lake is the biggest photography hot spot in Banff National Park but I didn’t include it. Unlike the other spots, it is not easily accessible year round with a road closure in place from Early October to Late May each year. During this time it is accessible on skis but the last few kilometres are subject to avalanche hazard so it is not recommended without the right equipment, training & partners. 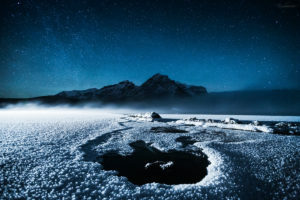 Even then the photography is not as straight forward as the lake is frozen and snow covered. 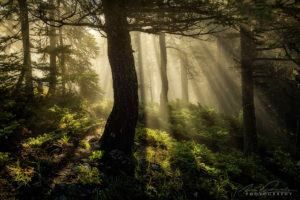 Get information on my next photography workshop with Sarah Lyndsay in The Canadian Rockies running June 2nd – 8th 2019 on EVENTBRITE – click here or below. 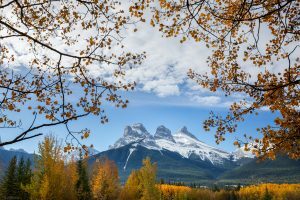 For information of the weather in Banff National Park in each season check out this great blog post by clicking here. 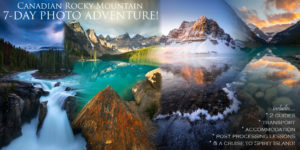 Previous Previous post: Welcome to Mountain Photo Tours – Unique experiences in Banff, Lake Louise & The Canadian Rockies!